MaryLou Luther and Diane von Furstenberg at The Fashion Group International's 30th Annual Night of Stars on October 24th, 2014. An article by Marylou for the Chicago Tribune from 1958. Marylou, Thea Porter and Jody Jacobson at dinner in Beverly Hills in the late 1970s. From Thea Porter's personal papers. At an article Marylou wrote on Thea Porter for the LA Times Magazine in January 1978. From Thea Porter's personal papers. Sonia Rykiel pinning the Chevalier of the Order of Arts and Letters onto Marylou in a ceremony in Paris in 2008. 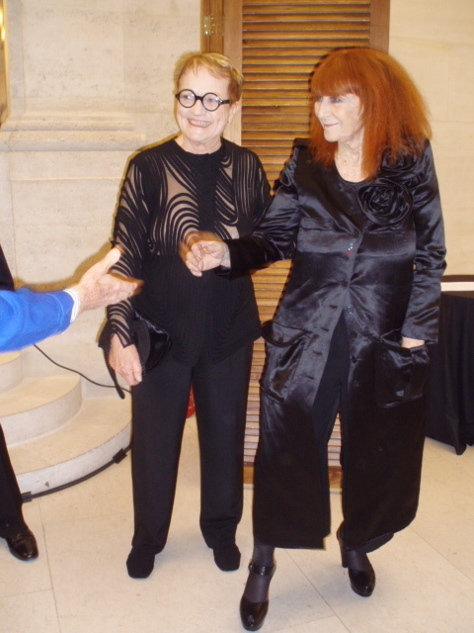 Marylou and Sonia Rykiel after the Chevalier of the Order of Arts and Letters ceremony in 2008. With these interviews I’m seeking to learn from cultural creatives about how following their passions has molded their lives and careers—what choices they’ve made, where it’s led them and how they created the lives of their dreams. Earlier this summer I sat down with acclaimed fashion journalist Marylou Luther to discuss her long and continuing career. From Cambridge, Nebraska (population 1,041), Luther was the daughter of an entrepreneurial farmer who owned a car dealership and grocery store.After studying journalism at the University of Nebraska, she started her career in her home state in the early 1950s, working on what was then called the “woman’s desk.” After transferring to the Des Moines Register, she was tasked with writing about fashion. Though unknowledgeable about fashion at first she became captivated by how changes in dress reflected changes in society at large, and has dedicated her life to the study of it. As the fashion editor for the Chicago Tribune she interviewed Christian Dior a few months before his death in 1957, then traveled to Paris to see Yves Saint Laurent’s first collection for the house. Writing for the LA Times in the late 1950s brought her out west, before McCall’s Sportswear came calling and she moved to New York in 1961. A few months later she married her boss, Arthur Imparato, who owned a group of fashion trade publications. The late 1960s brought them to Los Angeles along with their sons, as she returned to the LA Times. As she discusses in our interview, they had a busy social life interacting with Hollywood royalty and visiting fashion megastars. Among her closest friends was legendary costume designer Edith Head. Marylou’s Nebraska upbringing is clearly illustrated by her kindness, warmth and genuine desire to help others—all qualities not always found in the fashion industry. Her generosity of spirit was an obvious boon to her career—endearing her to newspaper editors, PR agents and designers alike. Establishing deep friendships with many of the designers, photographers and artists that she met over the years, the walls of her NYC apartment are covered in sketches given to her by such luminaries as Antonio, Ruben Toledo, Donfeld, Isaac Mizrahi, Karl Lagerfeld and more. Marylou has been so central to the fashion world for decades that designers as diverse as Geoffrey Beene, Rudi Gernreich and Thierry Mugler all chose for her to write the text for their books. After retiring from the LA Times in the mid-1980s and moving back to NYC, Marylou has devoted most of her time to the Fashion Group International, of which she is the creative director. Every season she attends the shows in New York, London, Milan and Paris, and then puts together an audio-visual presentation that tracks the trends and which is shown to all members of the FGI. This has been a constant in her life since the late 1960s, and since that time she has also written a newspaper column, called “Clotheslines,” a question-and-answer fashion advice feature syndicated across the country and read weekly by more than 5 million. Due to her decades of writing about and publicizing French fashion worldwide, in 2008 the French government's Ministry of Culture presented her with the Chevalier of the Order of Arts and Letters; the medal was pinned on Luther by her good friend, Sonia Rykiel. She has also won the Council of Fashion Designers of America’s coveted Eugenia Sheppard award for fashion journalism, the Women in Communications award and, in 2004, the Accessories Council’s Marylou Luther Award for Fashion Journalism, which is given every year in her name. As with many of the creators I have interviewed for this series, her passion for her career has never waivered yet her deepest love and pride lies with her family. Her husband passed away in 1998, after a long and very loving marriage. Their children and grandchildren have successful, interesting careers, and as you will hear in the interview, Marylou takes great joy in their achievements. In May Marylou gave a commencement speech to the seniors graduating from her hometown in Cambridge, Nebraska, in which she repeated advice given to her by the famous—Edith Head, Geoffrey Beene, Thierry Mugler—as well the unknown—her two grandsons. To her, familial love is her greatest success and pride. In this speech, Geoffrey Beene’s advice perhaps gives the clearest sense of how Marylou has retained such passion and engagement in fashion after seven decades writing about it. He told her, “Don’t be afraid of the future; don’t be afraid to create something new.” Marylou Luther holds no fear of the future—only excitement, interest and curiosity in what is coming next.